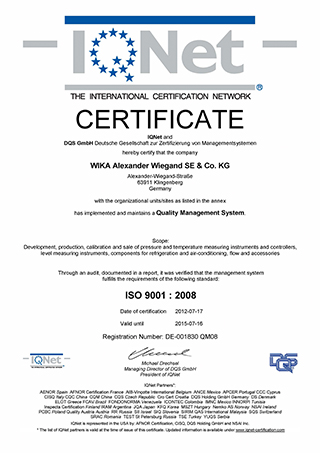 WIKA has successfully established matrix certification within its global quality strategy. With this method, 22 subsidiaries, by themselves, have so far transformed their existing local ISO 9001 certifications into a joint certification for the WIKA Group. 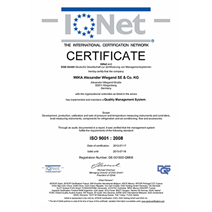 The aim is to standardise the process quality within the entire group and to initiate permanent improvements. WIKA has therefore entrusted a world-renowned certification body with the external audits: the globally-represented German Association for Certification of Management Systems (DQS). All assessments in accordance with ISO 9001 throughout the WIKA Group will now be conducted exclusively by the same DQS team from Germany. In parallel to this, the matrix method standardises the internal audit processes, which are coordinated from WIKA's headquarters in Klingenberg. A new computerised module enables quality indicators to be comparable worldwide, while internationally-engaged WIKA auditing teams give additional impetus for "best practice" processes. With the matrix model, WIKA has taken a further step to simplify their international business. Since, in the future, the quality process will be documented equally transparently and uniformly at all locations, it reduces, for example, the coordination effort required for contracts or framework agreements. The WIKA complaint management, introduced at the same time as the WIKA Matrix, enables instrument tracking and expedites the overall claims process, and responsibilities can be assigned without losing time. 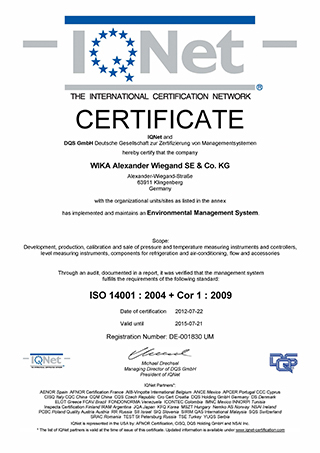 WIKA will also use the matrix model in the checking of the Environmental Management Systems in accordance with ISO 14001. Because of the complex legal situation, the external audits will be run by the regional DQS offices. The seven previously-certified locations include China, India and Brazil.